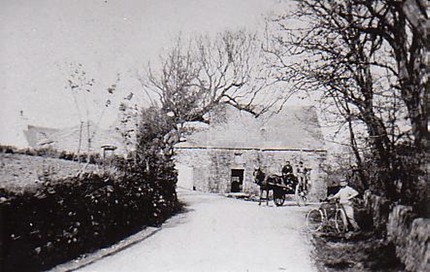 The Kentraugh Mill in about 1900 just a few years prior to it being sold, after over 400 years in Qualtrough ownership. In the Isle of Man, in Rushen Parish, is a Little Mill, called Kentraugh. Because is was in the QUALTROUGH family for several hundred years, it is worth a moment in the annals of time to consider its history and its importance in the lives of the people of "Our Family"who owned and ran it. "The earliest record so far found shows that the Mill was working in 1506 when it belonged to Robert QUALTROUGH (McWHALTRAGH). If it was then working, it is likely that it was doing so for several centuries before that. Being an "ancient mill" it had to feed each year a "tithe pig", the property of the Lord of Man. "The Mill remained the property of the Qualtrough family (see ownership of the Mill down through the generations below) right down to 1904, when the two surviving sisters of William Qualtrough sold it to John Woods of Ballabeg, himself a miller. It continued to be worked by him and later by his family or tenants until July 1943, and then it stopped for good. Water-power and grinding stones, after two thousand years had to give way to speed in the shape of electricity and rollers. "It was believed that the Mill was largely rebuilt in about 1832, or possibly earlier, and that was almost certainly when the present machinery was installed. Most of the wheels are cast iron, though the stone nuts (the pinions driving the stones) have wooden teeth, and the pit-wheel on the water-wheel shaft is wooden with a cast-iron rim and teeth. Prior to about 1800 they would all have been constructed entirely of wood. 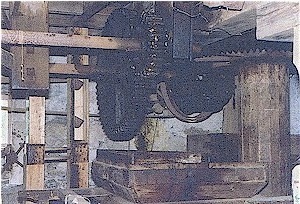 A photograph taken in 1994, showing the reconstructed inner-workings of the Kentraugh Mill. "The machinery, though it looks at first sight primitive and cumbersome, is not so at all; it is simple and ingenious and perfectly adapted for its work. "The construction of the smallest stone is fascinating. It is what is known as a French burr stone, made of chalcedonic hornstone, found in the Paris basin at La Ferte-sous-Jouarre, 70 kilometres east of Paris, and at Epernon, 60 kilometres to the west, and which is only quarried in small pieces. The finished millstone is built up out of twenty-five pieces, fitted together on the arch principle, set in a bed of plaster of Paris and bound with iron rings shrunk on. The grinding power of a French burr stone of four feet in diameter was equal to that of a six feet diameter one-piece stone of millstone grit from Yorkshire or the Peak, of which the other two stones are made. "It is interesting to realize that this stone was so valuable that in 1809 arrangements were made for its importation for a period of three months, even though this was right in the middle of the Napoleonic Wars. "One of these millstones which was worn out and thrown away 45 years ago was rescued from under a pile of debris and herbage in front of the Mill and has been rebuilt on the dam by the house. "Great skill and experience and much hard work was required to dress the stones, that is, to cut the grooves in them with a steel chisel, weighing about three pounds, at the right angle and to the correct depth to ensure proper grinding as well as to adjust them to the right clearance and to balance them so that they ran evenly. A stone required dressing after about 300 hours work, during which time it had possibly ground a thousand sacks of grain. 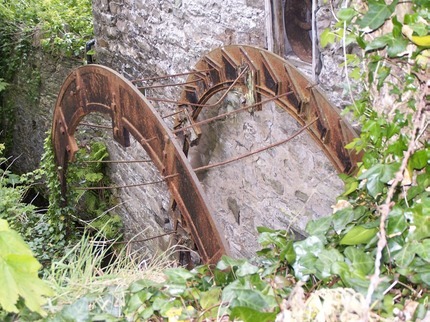 "The water-wheel itself is what is known as a breast-shot wheel, that is to say the water enters the wheel at a height somewhat above the level of the axle, acting solely by gravity and turning the wheel towards the flume or headrace. It is 14 feet in diameter, 4 feet 6 inches wide and has 46 buckets made of wooden boards set between cast-iron rims. Two buckets contain about 12 cubic feet of water. The axle is wooden, 15 inches or more in diameter, with a steel rod 3 and a half inches in diameter through the centre, which rod rests in the bearings inside and outside the Mill building. The spokes of the wheel are wooden. The existing wheel was built and started work in about 1888. Kentraugh Mill as it is today. "The wheel probably turned at some four revolutions a minute and developed at this speed roughly six horse-power. There was only enough power to drive one pair of stones at a time. Shortage of water was always a difficulty in most water-driven mills, and John Woods, during his ownership, tried to solve this problem by installing a Crossley oil engine on the bottom floor, driving the whole mill, including the wheel, by means of the shaft which is still there. This, however, was not a satisfactorily solution, because the oil engine needed the almost undivided attention of one man to keep it going. "Oats and barley were ground in the mill; crushed oats and barley meal for animal feeding, sieved oats for porridge, oat cakes and the like, and barley flour. As well as the three pairs of stones, the sack hoist and the oats bucket elevator (which has been remade), the various auxiliary engines for sieving oats and making barley flour, together with the cleaning and winnowing machinery, are all in working order. Oats before being ground were dried on metal sheets over the coke furnace in the drying tower or kiln, a hot, dirty and unpleasant task, not without danger. To add to all the difficulties of milling, the work was done in what would now be considered semi-darkness and in an exceedingly dusty atmosphere. Furthermore, a one-and-a-half hundredweight sack is not the lightest of burdens to move about. "No-one regrets more than myself that it has not proved practicable to restore the water-power to the Mill. To renovate the wheel would necessitate its complete reconstruction, as all the wheel buckets have disappeared, the wooden axle is perished and so are the spokes. The walls of the dam will not now hold water, the sluices are rotten or missing, the leat, which is nearly half a mile long, is entirely filled in and overgrown, while the dam across the river has long since swept away. However, the inside of the Mill has been restored to its original condition and the machinery can now be seen running again, just as it has done for so many years." Mr RM Nuttall, 1969. This research of the Qualtrough ownership of the Kentraugh Mill was done by John K Qualtrough of Port St Mary, Isle of Man, in the 1960s for Mr Nuttall. It lists the Qualtroughs who owned the Mill at various stages. It was not necessarily handed down from father to son, so to speak. 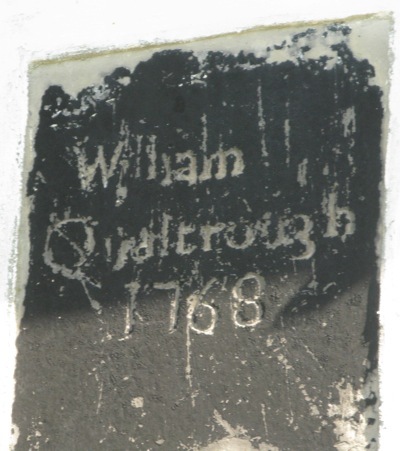 At times marriages appear to have been "arranged" to ensure the Mill stayed "in the family"
William Qualtrough (bn 1838, above) was the last male Qualtrough to own the Mill. He never married and pre-deceased his sisters, none of whom married either. 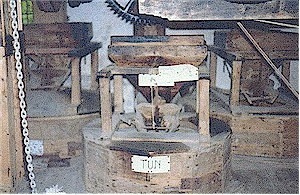 The Mill was sold in 1904 by the two eldest sisters of the above family to John Woods of Ballabeg, Arbory, Isle of Man.